Colin Luther Powell, KCB (Honorary), MSC, (born April 5, 1937) is a retired General in the United States Army. He was the 65th United States Secretary of State (2001-2005), serving under President George W. Bush. He was the first African American appointed to that position. 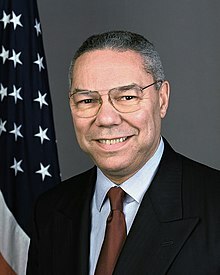 As a General in the United States Army, Powell also served as National Security Advisor (1987–1989) and as Chairman of the Joint Chiefs of Staff (1989–1993), holding the latter position during the Gulf War. He was the first and, so far, the only African American to serve on the Joint Chiefs of Staff. He was born Colin Luther Powell on April 5, 1937, in Harlem, New York City, New York. His father, Luther Powell, was a shipping clerk. His mother, Maud Powell, was a seamstress. Both had immigrated to the United States from Jamaica. He grew up in south Bronx. He joined the Reserve Officers' Training Corps (ROTC) while he was a student at City College of New York. He commanded his unit's precision drill team and achieved the highest rank in ROTC, cadet colonel. When he graduated in 1958, he was commissioned a second lieutenant in the United States Army. His first assignment was in West Germany. He was promoted to the rank of Captain on 1 June 1962. Powell then served two tours of duty during the Vietnam War. He was wounded twice while in Vietnam. Once by a Viet Cong booby trap. He received a Purple Heart. A year later he received a Bronze Star Medal. He was wounded a second time in a helicopter crash where he saved two other soldiers. For this action he was awarded the Soldier's Medal. Between his two tours in Vietnam, Powell was promoted to the rank of major in May of 1966. Powell then earned an MBA degree at George Washington University in Washington, DC. He received a White House fellowship and worked in the Office of Management and Budget during 1972–1973. As a lieutenant colonel Powell served as a battalion commander in the 2d Infantry Division. In 1975 Powell was promoted to full colonel and became a brigade commander in the 101st Airborne Division. He was promoted to the rank of general in 1989. He was appointed to the position of Chairman of the Joint Chiefs of Staff by President George H. W. Bush. He oversaw a number of crisis situations including Operation Desert Storm. In 1993 he retired from the military as a four-star general. In 2001 he was nominated and confirmed as US Secretary of State. After the September 11 attacks he took a leading role in aligning allies for military action in Afghanistan. Powell dealt with a number of international crises including a near war between India and Pakistan (both of which had nuclear weapons) in 2001-2002. In February 2003 he appeared before the United Nations Security Council. He presented evidence that Iraq was hiding weapons of mass destruction (WMD). This convinced many in the US that Iraq was a threat. In September 2004 he appeared before the United States Congress to testify that the intelligence used to show Iraq had WMDs was wrong. Then, on November 15, 2004, Powell announced his resignation. 1993 he was the founder of America's Promise. This is a charitable organization that helps at-risk children. 1993 was awarded an honorary Knight Commander (KCB) of the Most Honorable Order of the Bath by Queen Elizabeth II. 1995, Powell published his memoir, "My American Journey". 1997 he started America's Promise Alliance to help children and youths. 2012 he published his second memoir "It Worked For Me: In Life and Leadership". ↑ 1.0 1.1 1.2 1.3 1.4 1.5 "Colin Powell Biography". Bio/A&E Television Networks, LLC. Retrieved 21 December 2015. ↑ 6.00 6.01 6.02 6.03 6.04 6.05 6.06 6.07 6.08 6.09 6.10 "Colin Powell Fast Facts". CNN. 15 March 2015. Retrieved 21 December 2015. ↑ 7.0 7.1 7.2 7.3 7.4 7.5 "Biographies of the Secretaries of State: Colin L. Powell". Office of the Historian, Bureau of Public Affairs, United States Department of State. Retrieved 21 December 2015. ↑ 8.0 8.1 "Colin Powell Biography". American Academy of Achievement. Retrieved 21 December 2015. ↑ 9.0 9.1 "Colin Powell Biography". Encyclopedia of World Biography. Retrieved 21 December 2015. Wikimedia Commons has media related to Colin Powell. This page was last changed on 24 January 2019, at 16:56.